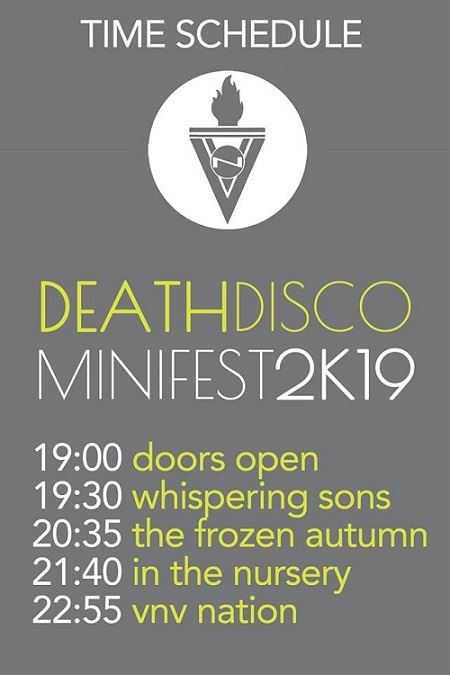 Last Day Deaf is more than excited to be the Media Partner for one of 2019’s events: The DeathDisco MiniFest 2K19. For this special, and ultra rare, occasion Death Disco goes to Fuzz Club! 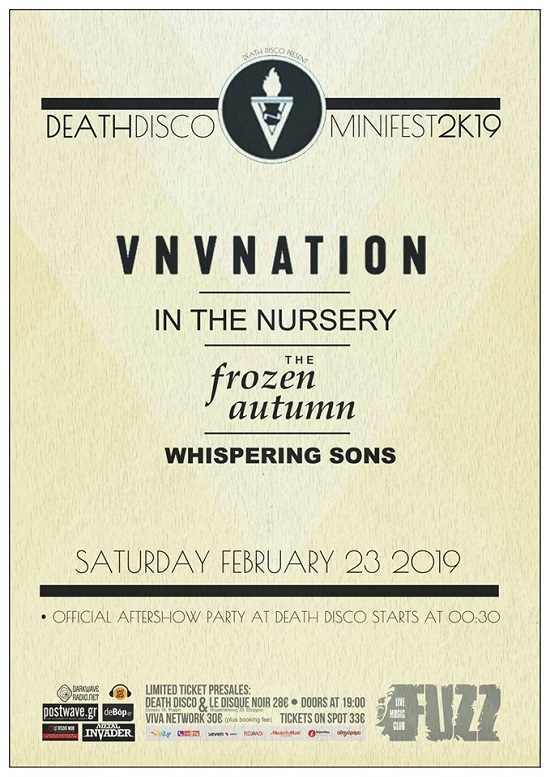 On Saturday, February 23rd, some of the most important acts of darkwave / electro / post-punk will hit the Athenian stage, with undeniable headliners, one of the most successful dark alternative band, VNV Nation, In The Nursery from England, Italian darlings The Frozen Autumn and Whispering Sons from Belgium, DeathDisco MiniFest comes to offer us not just one yet pleasant night out but an experience long awaited by the friends of the dark alternative scene in Greece. A mini festival that brings together the four different trends of the dark scene with four bands, top of their genre, and exactly aware of what to do on the stage to gain the impressions. Over this brief period (not even 3 years!) Last Day Deaf has been active, it managed to undertake invaluable interviews with 2 of the aforementioned bands. So, be sure to check them out below! Over the course of the project’s career, VNV Nation has continued to reach new heights, with its last 3 albums charting top 10 in Germany, as well as tthe most recent album reaching top 5 Billboard Chart positions in the US. Ronan Harris was born in Dublin, Ireland and lives in Hamburg, Germany. In The Nursery is the Sheffield-based musical project centered around the nucleus of twin brothers Klive and Nigel Humberstone. ITN’s musical history spans three decades and has constantly expressed their desire for progress and experimentation. Their sublime, cinematic music blends electronica, classical arrangements, orchestral percussion and soundscapes evoking a timeless quality. Currently based in Berlin (Germany) and Treviso (Italy), THE FROZEN AUTUMN was born in1993 in Turin (Italy) thanks to Diego Merletto, who had been already involved as a singer and keyboard player in several bands of the dark-wave local scene since 1987.The background inspiring Diego has been the music released by the British label 4AD in the ’80, together with European cold-wave, especially the electronic one, belonging to the same era. Neverthless, since the issue of the first and only demo, “Oblivion”, dating back to 1994, the sound of TFA (initially Diego’s one-man band) immediately stood out for its original melodic frames and rigorous sound research amounting to dreaming-atmospherical tracks as well as danceable songs reminding of 80’s electronic wave, all style cornerstones to be found throughout the band’s productions. In the same year, Diego decided to rely upon a guitarist for the live concerts that had soon been scheduled, even though he also decided to stay the sole and only mastermind as for TFA compositions: so did Claudio Brosio come into the picture. In 1995 the debut album “Pale Awakening” was released for the label Weisser Herbst: it contains “Oblivion” 6 tracks + 4 brand new tracks, among which the unforgettable piú “This Time”, real dancefloor hit for this music genre lovers. During the same year the duo performed abroad for the first time at Die Insel, Berlin historic location situated on an isle of river Spree. This album got great feedback: even though it hadn’t been massively promoted at all, sold over 5000 copies, a huge amount for a non-mainstream band at its debut on the market. Diego decided to leave W.H. for the Milan-based Eibon Rec., that released the band’s second album “Fragments Of Memories” in Dec 1997, (featuring another outstanding track: “There’s No Time To Recall”), a full-lenght that is everything but minimalistic, whose arrangements are generous, its harmonies rich, open, catchy. This album marked an increased interest for the artwork (made by the band itself) and the debut as a singer of a very young Froxeanne, not part of the band yet at that time. Several successful live gigs in Italy and Germany followed, climaxing in April 1998 at Tenax in Florence, Claudio’s last concert with TFA.Immediately afterwards, Diego Merletto & Froxeanne (vocals and keyboards) conceive a side-project, named STATIC MOVEMENT. After 6 months of frantic co-writing work, “Visionary Landscapes” (Eibon Rec., March 1999) CD was born: 10 electronic jewels made with an Elka Synthex, a PPG Wave 2.2. and a S.C.I. Pro-One.This year marked the developement of another great passion of Diego’s, videoart, (already massively expressed during TFA concerts by means of his evocative self-made background videos) by producing the black and white videoclip of the song “Nouvelle Vague” (track included in “VisionaryLandscapes”), released as a multimode cd-rom in 2001.Even though the duo has released only one album as STATIC MOVEMENT, this side-project experience was important because it laid the foundations for the so-called “electronic shift” of TFA, as witness as shown by their next release: “Emotional Screening Device” (Eibon 2002). Carachterized by driving electronic filigrees, in addition to catchy, dynamic rhythms, (as for the teaser “Is Everything Real?”, whose videoclip was filmed later), as well as episodes of hypnotic instrumental electro. Several concerts followed, all arousing great interest, but particularly successful was the one taking place in Sept 2002 at the legendary “Paradiso” club in Amsterdam.In 2003 TFA broke their relationship with Eibon and begun the tormeted composition of their new album and made some collaborations with other artists. In 2004 the the band finally played live also outside Europe, namely in Chile and e in Peru, literarly sending the audience into a frenzy.The new album “Is Anybody There?” was finally released in Sep 2005 by Pandaimonium Rec., by Twilight Rec. and by Gravitator Rec.”Is Anybody There?” is an ice-cold, styilistically flawless album, a never redundant “electro-chiselled” work: its essential, clean, almost graphic elegance, make it TFA least easy -listening release. Probably these features were the key to access one the most fascinating places in Eastern Europe: so did the duo lands in 2006 also in Russia for 2 unforgettable concerts in Moscow and Saint Petersburg. During the following 3 years, the duo collaborated with other artists not only for music works, but also for graphic layouts and videoart. At the end of 2007, the band rescinded the contract with Pandaimonium Rec. and in the same period they started to rely upon a live guitarist again. The band performed then in Itay and the Netherlands, then in 2008 took contact with Twilight Rec. again that in 2009 released 3 cd-digipack reprints (2 by TFA, and the SM album). During Autumn 2009, another live member got on board, for keyboards this time: The Count (from the electronic solo project Nabla Operator). With this 4-member-line-up, (which didn’t last for long) most of the double DVD “Seen From Under Ice” (Twilight Rec., March 2010) were filmed. In December 2010, the first 10″ vinyl is released: the EP “RALLENTEARS” featuring 4 brand new tracks, issued by the Italian label Calembour Rec. in 250 copies only, another chapter in their so peculiar music language they lately love to define “FROZEN WAVE” describing their ice-cold wave style.This new single songs are presented live on stage in Italy and in Brazil. On 30th Nov 2011 the band comes back with the long-awaited new full-length CD “CHIRALITY”, released by Calembour Rec. and issued on 14th Feb 2012 also in North America by Metropolis Rec., enthousiastically welcomed by their following all over the world. In 2013,Calembour Rec. celebrated TFa’s 20th anniversary by releasing the ltd. ed. digisleeve cd “Riding The Crest Of The Frozen Wave. A Tribute To TFA” and went back to the original duo line-up. In Dec 2014 a new EP “LIE IN WAIT” was issued by Calembour Rec, while their latest full-length “The Fellow Traveller” was released on 3rd Nov 2017 by Echozone/Soulfood and Metropolis Records. Whispering Sons is a Belgian post-punk band currently residing in Brussels. Feeding on the dynamics of the city, their music unveils feelings of alienation, propelled by an urging and ominous sound. Their live performances feel agitated and uneasy, yet always remain raw and honest. Whispering Sons’ first EP ‘Endless Party’ was released in 2015, followed by two 7 inches in 2016 and 2017. After winning Humo’s Rock Rally in 2016, one of Belgium’s most prestigious national contests, the band has been touring Belgium and Europe extensively. Their debut album ‘Image’ was released in October 2018.